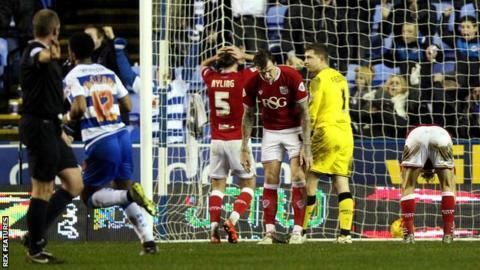 Nick Blackman's stoppage-time goal was enough to give Reading victory over Championship strugglers Bristol City. Reading's top scorer ran on to a Danny Williams pass and shot low past City goalkeeper Frank Fielding to net for the 13th time this season. City failed to hit the target as Luke Freeman came closest early on when he hit the side netting. Matej Vydra had a number of chances for the home side, as did Blackman before he eventually got the winner. The victory was the second for Reading manager Brian McDermott since taking over on 17 December and ended a run of one victory in their last seven games as they moved up to 12th place in the Championship. City have now won just twice in their last 14 league games, a record stretching back to the middle of October, and are in the final relegation place by virtue of goal difference. Reading controlled much of the opening period with Jake Cooper, Vydra and Oliver Norwood all going close. Orlando Sa and Williams had efforts blocked after the break, while Vydra headed straight at Fielding and Blackman headed over before getting the late winning goal. "Matej could have scored two or three goals today. He worked his socks off, he kept putting himself on the line, which was really important. He never hid. "And he's made an unbelievable tackle late in the game. He gave the ball away, ran after it, made that unbelievable tackle and then gave a terrific pass to Garath (McCleary). In a way, that tackle has been a match-winner for us. "I'm delighted for Matej and the whole group. It's all about belief and confidence. But the win will give us that little bit extra confidence. To get it so late, it's a big, big win." "We played very well today. Collectively, we've got a lot of young lads who are learning the hard way at this level. "The players are giving me everything they can possibly give me. Today was just one of those painful defeats." "It was disappointing to concede their goal. At the time, we were the team that were looking for three points. I thought that we were the team in the ascendancy." Match ends, Reading 1, Bristol City 0. Second Half ends, Reading 1, Bristol City 0. Goal! Reading 1, Bristol City 0. Nick Blackman (Reading) left footed shot from the centre of the box to the bottom left corner. Assisted by Danny Williams. Offside, Bristol City. Elliott Bennett tries a through ball, but Jonathan Kodjia is caught offside. Marlon Pack (Bristol City) wins a free kick on the right wing. Attempt missed. Danny Williams (Reading) right footed shot from outside the box is too high following a corner. Corner, Reading. Conceded by Joe Bryan. Attempt missed. Chris Gunter (Reading) right footed shot from the centre of the box misses to the left. Assisted by Garath McCleary. Attempt blocked. Bobby Reid (Bristol City) right footed shot from the left side of the box is blocked. Assisted by Joe Bryan. Substitution, Bristol City. Bobby Reid replaces Luke Freeman. Corner, Reading. Conceded by Liam Moore. Attempt blocked. Nick Blackman (Reading) left footed shot from the right side of the box is blocked. Assisted by Hal Robson-Kanu with a through ball. Attempt missed. Nick Blackman (Reading) right footed shot from the right side of the box misses to the right. Attempt blocked. Garath McCleary (Reading) left footed shot from the right side of the box is blocked. Assisted by Danny Williams. Attempt missed. Nick Blackman (Reading) header from the centre of the box is too high. Assisted by Garath McCleary with a cross. Substitution, Reading. Hal Robson-Kanu replaces Andrew Taylor. Attempt blocked. Joe Bryan (Bristol City) right footed shot from outside the box is blocked. Assisted by Luke Freeman. Attempt blocked. Liam Moore (Bristol City) left footed shot from the right side of the box is blocked. Assisted by Aden Flint with a headed pass. Anton Ferdinand (Reading) is shown the yellow card for a bad foul. Foul by Anton Ferdinand (Reading). Jonathan Kodjia (Bristol City) wins a free kick in the attacking half. Corner, Bristol City. Conceded by Anton Ferdinand. Attempt blocked. Luke Freeman (Bristol City) left footed shot from outside the box is blocked. Assisted by Aaron Wilbraham. Stephen Quinn (Reading) is shown the yellow card for a bad foul. Anton Ferdinand (Reading) wins a free kick in the defensive half.